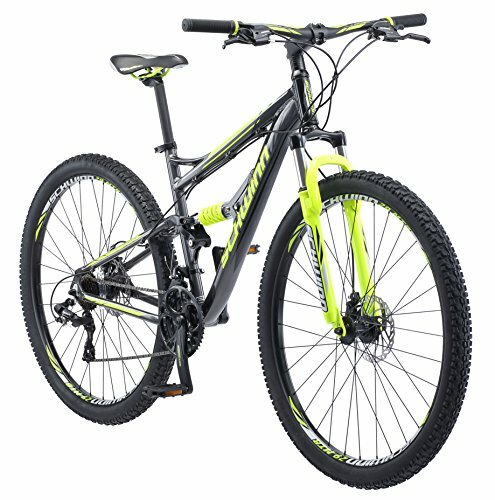 Purchasing a new bike can be a difficult task. Perhaps you are unsure of whether you need gears, or you are unsure about what the suspension is for, or even what size you need to buy. The bicycle market is currently jammed full of numerous brands and models of bike, some featuring traditional, classic designs while other bikes feature a sporty, mountain bike design. Some brands produce their sizing guidance through measuring wheel size, while other brands measure the frame, and other brands use a unique measurement system which they have created themselves. We have reviewed ten of the best bike brands and models currently on the market, allowing you to discover which bike brand and model is perfect for you and your needs. The Sixthreezero Around the Block Men’s Cruiser Bike is available in either a 24-inch wheel or a 26-inch wheel variety, offering a more traditional and vintage style of men’s bike to enable you to stand out from the crowd. 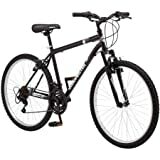 This bike is available in several color choices, with a black matte or gray matte frame providing the foundation of the bike, while you are free to choose a black, brown or white seat and grips. Offering flexibility, this bike is a great choice for a leisurely bike ride around the beach, while the seven-speed Shimano external hub ensures that you can adapt your riding to suit the demands of the day. Features include a dual-spring saddle in addition to a wide cruiser handlebar, complete with foam grips. The 2.125-inch wide aluminum wheels offer large, cushioned wheels with a waffle tread, ensuring easy rolling and maneuvering. Furthermore, a rear bike rack is included in order for you to store your baskets or other luggage. The Sixthreezero Around the Block Men’s Cruiser Bike weighs around 34 lbs. Why We Liked It – The Sixthreezero Around the Block Men’s Cruiser Bike is a great purchase if you are looking for a traditional style classic bike which also utilizes the modern features such as the seven-speed Shimano external hub in order to achieve a wide range of riding capabilities. Furthermore, choosing from a variety of seat and grip color choices enables you to add a unique twist to the style of your bike. 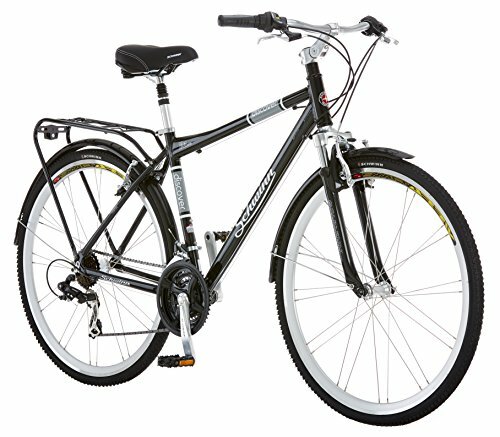 The Schwinn Discover Hybrid Bicycle offers either a black men’s style of bike or a white women’s style of bike, providing a rear rack so that whichever bike you choose, you will have sufficient storage for your belongings. Providing a comfortable ride across an aluminum frame to achieve an easy to maneuver ride, this bike features dual density construction in addition to a Schwinn suspension fork. Offering a 21-speed SRAM grip shifter and Shimano rear derailleur, you are provided with the tools you need to pedal uphill faster and easier. 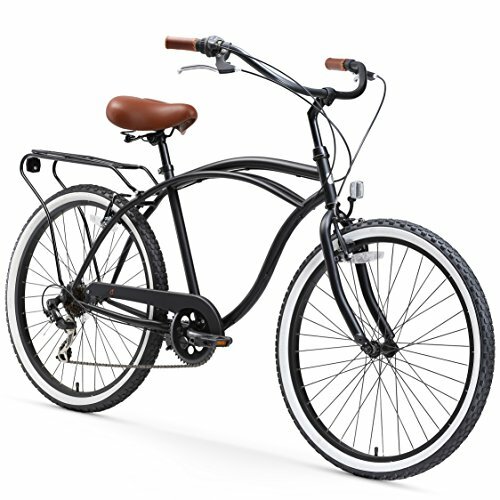 Furthermore, the Schwinn Discover Hybrid Bicycle provides alloy linear pull brakes in addition to a gear carrier and swept-back upright handlebars, This hybrid bike weighs around 46 lbs. Why We Liked It – The Schwinn Discover Hybrid Bicycle provides some great features, including a Schwinn suspension fork, a 21-speed SRAM grip shifter, and a Shimano rear derailleur, ensuring that you receive all of the best features required from a modern bike. Furthermore, the aluminum frame provides a light and easy to maneuver ride. The Raleigh Bikes Venture 3.0 Comfort Bike is available in a silver or a dark green color choice and is shipped to you partially assembled. The sizing of this bike is rather unique, with an individual possessing a height of 5-foot 3-inches to 5-foot 6-inches fitting a small size while a medium size will fit an individual from 5-foot 6-inches through to 5-foot 9-inches in height. For the taller individual, a large size bike will suit the height of between 5-foot 9-inches to 6-foot, while an extra large will be perfect for an individual up to 6-foot 4-inches in height. The lightweight frame effervesces true comfort, ensuring that your back possesses an upright position when riding and therefore ensuring that your neck and back experience reduced strain. Features include a suspension fork in addition to a seat post, reducing the number of bumps which the body feels when riding. A comfort saddle and a tire width of 1.95-inches enhances your pleasure and ensures that your bike can handle every possible terrain. Why We Liked It – Finding out what size you require from your bike can be a difficult task, and so the Raleigh Bikes Venture 3.0 Comfort Bike makes it easier for you to purchase. Solely using your height as a guide is simple, straightforward and accurate and takes some of the guesswork out of purchasing a bike. 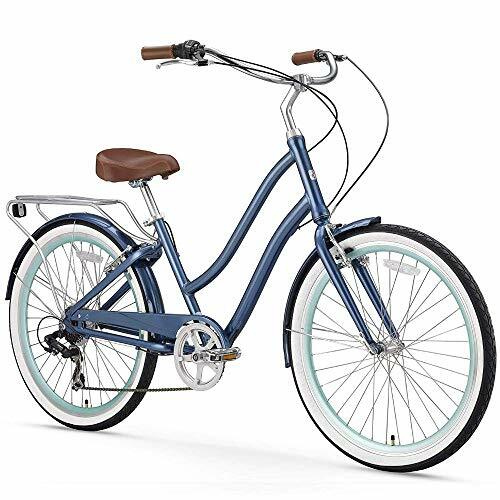 The Sixthreezero EVRYjourney Women’s Step-Through Hybrid Bike offers a traditional and classic style and a 26-inch wheel size. Available in a range of designs and seat and grip colors, there is a mass of potential with this bike, in particular, a striking teal color frame with either a white, black or brown seat and grips. Features include a light aluminum frame, ensuring that your bike is easy to maneuver and ride, and is the perfect mode of transport for both leisure and commuting. The upright riding style ensures that your back and shoulders are comfortable and that your legs fully extend, encompassing a curvy frame with a dual-spring saddle, matching fenders and rear rack for storage. The single-speed function is perfect for flat ground, while the front handbrake and additional rear coaster brake provide fast and efficient stopping. Why We Liked It – The Sixthreezero EVRYjourney Women’s Step-Through Hybrid provides some great features, offering a traditional bike style with some fantastic color combinations. Our particular favorite is the iconic navy color frame with brown leather grips and seat. The Diamondback Cobra 20 Complete Bike provides a Shimano six-speed drive train in addition to a trigger shifter which ensures that shifting is simple. 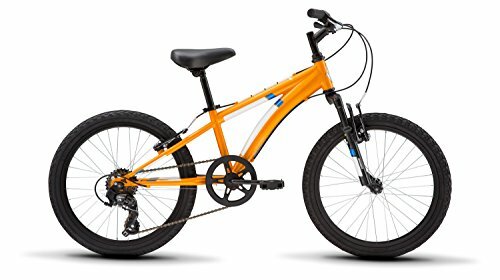 Offering an orange color choice with striking black wheels, this bike additionally provides a 40 mm travel fork in order to absorb bumps on the road. Linear pull brakes in addition to an adjustable-reach lever work in combination to ensure that stopping is safe and efficient, while the chunky tires provide off-road comfort. The Diamondback Cobra 20 Complete Bike weighs 34.6 lbs and suits riders from 44-inches tall through to 54-inches tall, being assembled quickly in four easy steps. 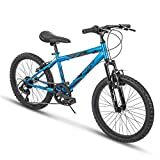 Why We Liked It – The Diamondback Cobra 20 Complete Bike is a great purchase for children and teenagers, featuring chunky tires and safe brakes to provide off-road enjoyment throughout all seasons. 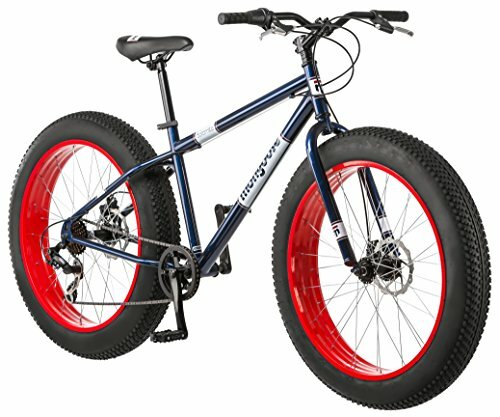 The Mongoose Dolomite Fat Tire Mountain Bike provides a striking design with super chunky wheels. The bike is available in three different color choices, from a flame red design to a blue and green choice or a navy blue with red flashes around the wheels. Off-road riding is easy and enjoyable, with the Shimano rear derailleur with seven additional speeds ensuring that you have the options and versatility desired from such a bike. The steel frame is tough and durable, while the threadless headset ensures that you can adjust the size for different heights. Strong alloy rims provide additional speed, and excellence in performance, while the disc brakes located at the front and the rear ensure comfort and efficiency. The Mongoose Dolomite Fat Tire Mountain Bike is perfect for riders with a height of 5-foot 6-inches up to a height of 6-foot tall, coming with a limited lifetime warranty and even ships fully assembled. Why We Liked It – The Mongoose Dolomite Fat Tire Mountain Bike provides some strong color designs, in particular, the navy blue frame with red flashes surrounding the wheels. The chunky wheels look great and provide off-road comfort and support. The Raleigh Bikes Women’s Superbe City Bike is available in three different color options; a strong green, a striking black, and a bright pink. The bike comes complete with rear basket storage, adopting a traditional and classic vintage style. Features include Raleigh’s unique sizing, with an individual possessing a height of 5-foot 3-inches to 5-foot 6-inches fitting a small size while a medium size will fit an individual from 5-foot 6-inches through to 5-foot 9-inches in height. For the taller individual, a large size bike will suit the height of between 5-foot 9-inches to 6-foot, while an extra large will be perfect for an individual up to 6-foot 4-inches in height. The Raleigh Bikes Women’s Superbe City Bike is shipped partially assembled. 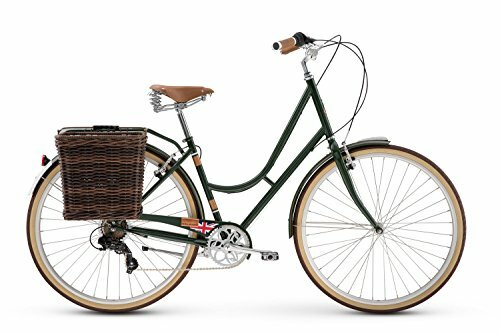 Why We Liked It – The Raleigh Bikes Women’s Superbe City Bike is a traditional, vintage bike, complete with rear basket storage and several color options. The easy sizing guide utilized by Raleigh ensures that you can easily choose the correct size bike to suit your height. 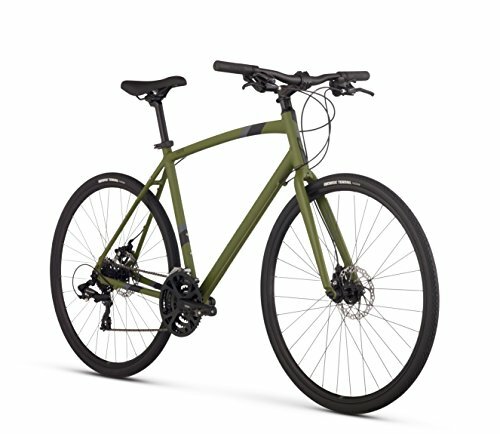 The Raleigh Cadent 2 Urban Fitness Bike features a mountain bike style and is available in a khaki green color choice. Adopting the sizing guideline of Raleigh, an individual’s height of 5-foot 3-inches to 5-foot 6-inches will fit a small size while a medium size will fit an individual from 5-foot 6-inches through to 5-foot 9-inches in height. For the taller individual, a large size bike will suit height of between 5-foot 9-inches to 6-foot, while an extra large will be perfect for an individual up to 6-foot 4-inches in height. The lightweight and durable aluminum frame ensure that the bike is easy to move and use, and helps you to sit upright in the saddle, protecting your posture and reducing strain. Tektro Novela mechanical disc brakes provide excellent stopping power regardless of the weather conditions, while the 24 gears provide versatility and multiple options for your ride. The Raleigh Cadent 2 Urban Fitness Bike is shipped partially assembled. Why We Liked It – The Raleigh Cadent 2 Urban Fitness Bike encompasses 24 gears and Tektro Novela mechanical disc brakes in order to provide you with a durable and efficient ride while being presented in a smooth khaki green color choice. The Schwinn Phocus 1500 Flat Bar Road Bike is available in either a 17-inch or a 19-inch frame size, offering a silver and orange design pattern. 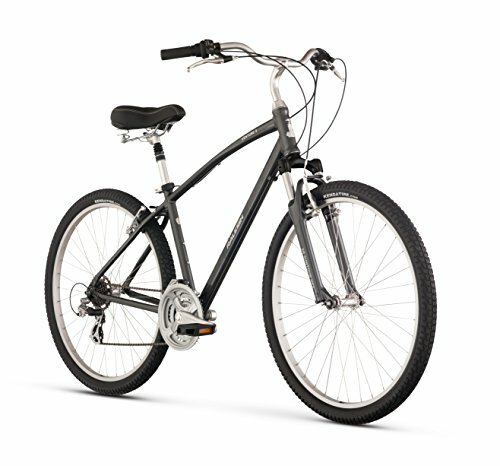 Offering a Schwinn aluminum fitness frame in addition to a Schwinn sport suspension fork, providing an efficient ride, high maneuverability, and great shock absorption. Features include Shimano 24-speed EZ fire shifters as well as Shimano front and rear derailleurs, ensuring that gear changes are precise and effective, while the mechanical disc brakes provide crisp stopping and durable riding. Providing alloy double wall rims to ensure stability, the bike further offers Shimano alloy cranks and an 8-speed cassette, ensuring gearing performance is high. The Schwinn Phocus 1500 Flat Bar Road Bike weighs 37 lbs. Why We Liked It – The Schwinn Phocus 1500 Flat Bar Road Bike provides some great Schwinn and Shimano features, enabling you to acquire high-quality parts and a fantastic ride. The Schwinn Traxion Mountain Bike offers 29-inch wheels, perfect for the taller rider. Featuring a black sports design with neon yellow flashes, the aluminum frame provides dual suspension and a Schwinn suspension fork which absorbs bumps off-road. Providing 24-speed Shimano EZ fire trigger shifters in addition to Shimano front and rear derailleurs, gear changes are smooth, easy and effortless. Furthermore, the mechanical disc brakes ensure that your bike stops when and wherever you need it to, regardless of the weather conditions or the terrain. Schwinn alloy cranks ensure steady gearing, providing a reduction in maintenance to aid ease of use, while the extra wide alloy rims increase strength and durability. The Schwinn Traxion Mountain Bike utilizes 2.25-inch chunky tires, perfect for off-road hills and bumpy terrain, and weighs around 49 lbs. Why We Liked It – The Schwinn Traxion Mountain Bike is the perfect bike for the taller rider, who may otherwise find it difficult to find a strong, high-performance bike with high-quality, specialist parts. Bikes are the most used mode of transport across the globe. As the world becomes further invested in health, wellbeing, and exercise bikes are becoming even more popular as individuals ditch the car and use their bike to commute to work. Leisure time is increasingly becoming dominated by bikes, also, as couples, friends, and families journey off-road on their bikes to enjoy some peace, tranquility, and exercise. As well as being great for your health and wellbeing, choosing a bike over a car or other type of vehicle is also great for the environment and your bank balance. You are able to decrease your carbon footprint and reduce the amount of pollution you emit; can you imagine the benefits to the environment if every individual across your state ditched the car and cycled to and from work and school every day? Additionally, after the one-off cost of purchasing your bike, you will have no other regular costs to pay, unlike owning a car which requires petrol as well as insurance costs. A bike will require periodic maintenance, for example, if your bike experiences a puncture, but these costs are minimal and occasional. When choosing your new bike, consider what you will be using it for and what you want from your new bike. If you will be commuting to and from work daily on your bike and you will be venturing off-road during weekends and holidays, then investing in a high-quality bike is of paramount importance as you will be relying on your bike greatly. If you are considering using your bike occasionally, then a lower cost model may suffice. The fashion across bike models in 2019 centers around traditional lines and vintage and classic frames. Many of these bikes feature a rear rack, with some bikes also featuring rear baskets. This style of bike is definitely on-trend and can feature in some very flamboyant color options to enable you to stand out from the crowd. Alternatively, you may prefer the sporty, mountain bike style, of which there is plenty of choices. Many bikes feature numerous gears and speed functions to provide an effortless ride as well as versatility. Many bikes currently on the market feature numerous gears and speeds, allowing you freedom of choice to meet your fitness level as well as suiting the terrain and weather conditions in which you are traveling. Other features include suspension forks, to absorb the shock when riding across bumpy terrain, providing you with a smooth and enjoyable ride. Disc brakes are also quite common with the more expensive bikes over the cheap bikes, replacing the traditional brakes on the wheel rim. Disc brakes are much more precise and efficient. 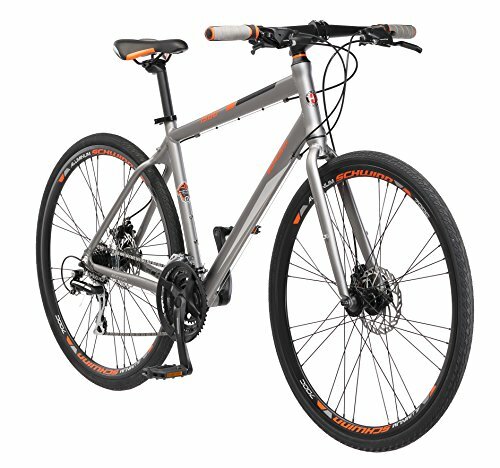 Q: Which size bike will I need to purchase? A: The size of the bike which you will need to purchase will vary, depending upon the brand of the bike which you are purchasing. You should therefore always check the manufacturers’ instructions. You will need to know your exact height, however, in feet and inches. Some brands, such as Raleigh, have made finding the perfect size bike easier for the consumer as bike sizes are clearly decided on the height of the rider and nothing else.